SHIRLEY, Mass. (CNS) — The only chapter of the International Thomas Merton Society that is located in a prison is at the Massachusetts Correctional Institution in Shirley, according to the 83-year-old who started it there. John Collins, who is a member of St. Mary Parish in Shrewsbury and writes columns about the popular Trappist monk for The Catholic Free Press, newspaper of the Worcester Diocese, said the chapter is one of 43 in the world. In January, three prisoners are to have essays published in The Merton Seasonal, a quarterly journal with articles, book reviews and other information of interest to the society’s members. The prison chapter is an outgrowth of a talk about Father Merton that Collins gave at the request of Catholics incarcerated there. 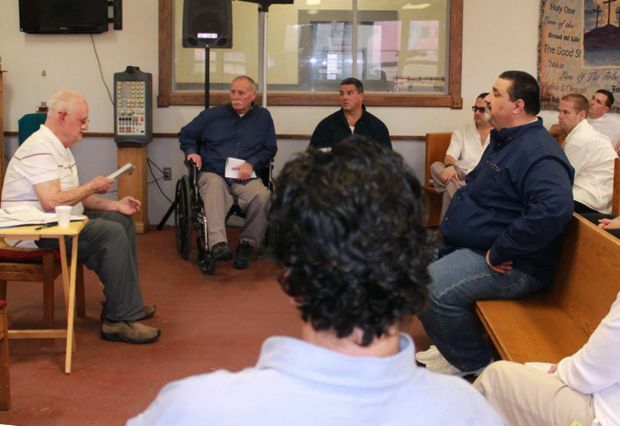 Prisoners said they learned about him and other speakers they’ve invited to come and talk to them through The Catholic Free Press and The Pilot, newspaper of the Archdiocese of Boston, in whose territory the prison is located. When they read about something of interest being offered somewhere nearby, they send the hosting parish a letter addressed to the speaker — or their chaplain makes a contact — to request a similar presentation for the Shirley prison’s Catholic community. Collins went to talk to the prisoners, and they asked him to come back. So, he started a monthly discussion of one of Father Merton’s books and formed the chapter. He said the essays the prisoners wrote for The Merton Seasonal include what they’ve gained from that Merton book, “New Seeds of Contemplation.” The prison bought 20 copies for the program when he started it in July 2013, he said. He may finish discussion of that book in a month and begin another Merton book with them. “I was inspired, I’m sure, by the Holy Spirit,” he said of starting the program there. He said he led one at his parish for 11 years, and formed a Merton Society chapter there, which no longer exists. “Somewhere around April of 2013, I said, ‘I think I’m going to let this go,'” he told the Worcester diocesan paper. He wanted to spend more time on writing, teaching religious education and participating in his Shakespeare group. Shortly after ending the St. Mary’s Merton program, Collins said, he received a letter sent to him at the parish. In it Shawn Fisher, a prisoner and secretary for the Our Lady of Guadalupe Chapel at the Shirley prison, said they’d been reading his Merton columns in The Catholic Free Press and asked him to speak about Merton there, he said. Speaking of Collins’ program, Deacon Arthur Rogers, a Catholic chaplain at the prison, said: “The men took to it, and he took to it.” He and Collins said about 12 to 20 medium-security prisoners attend the program the third Wednesday of each month. “It challenges the minds,” Deacon Rogers said. “Some of these guys are pretty sharp. They like to be challenged.” He said he has never seen anything like this in the prison system. Joseph Labriola, incarcerated for 41 years, said prisoners don’t have many things like the Merton program, and called Collins “a real special man” for giving them his time. “I push for … programs like this,” he said, explaining that the more education people get while in prison, the less likely they are to return if they are released. He recalled that when he was in “the hole” in the Massachusetts Correctional Institution in Norfolk in the mid-1970s, prisoners there were allowed only a Bible. But he found “Seeds of Contemplation” in his cell. “I used to read passages out the window to other convicts, and I’ve been addicted to Thomas Merton ever since,” he said. “A lot of it was so deep I couldn’t understand it,” Bolton said. “I would reread a line probably three or four times and I would pace back and forth and I would think about what it meant.” With Collins’ explanations, he sees it in a new light. The Merton group “affords men the opportunity to change, to re-evaluate their life in God’s light,” said prisoner Timothy Muise, who is looking toward his release date in three years, after 16 years in prison. “It gives me hope that if someone like Jack, with his pedigree, believes that I am worthy” to be part of the group, “I am worthy of the good things in life,” he added. “I’m one of them. I’m a prodigal in a distant land trying to come home,” he added. Connor is a staff reporter at The Catholic Free Press, newspaper of the Diocese of Worcester.